Copa Airlines looks to have just dropped their fares to Panama City, Panama (PTY) by about 50% on a variety of dates between September 2012 and May 2013. The flights are non-stop each way. It looks like clicking through to Orbitz or Expedia gives you the best chance of verifying the cheap price. Certain date combinations look to verify at a higher price however. 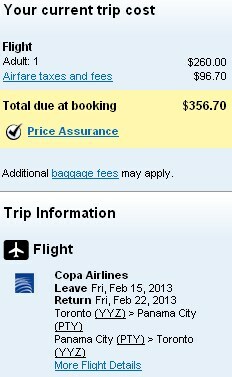 Clicking through to Copa Air may or may not result in the cheap price. toronto, yyz, flight deals, central america, panama city, panama, pty and copa airlines. 9 Responses to "Toronto to Panama (Central America) - $359 roundtrip after taxes - up to May 2013"
My mother flew COPA from Argentina to Toronto via Panama last month and she was very pleased with the whole experience (airplane comfort, service, timeliness, etc.). Do you expect Chris to magically control what the airlines or partner airlines website calculates as a final price? Chris works hard to share what he finds, let's give him credit instead of criticism. I am just checking on these fares and I've been able to find a few of the $356.70 prices... it seems as though if you look go through the COPA site it is more (double) than what I am getting through Orbitz. I'm looking at the beginning of April (the end of the dry season)... Has anyone been there at that time? I think he must work hard but when I just receive and email and I go to check all the links as well as do an orbitz search there should be no reason why the price isn't there. I could understand if it had been a few days. Click on the Orbitz link under $359. Looks like certain date combos are disappearing from Orbitz. Just tried Jan 16-25 and it still verifies at $356. Wow John, I can't believe an adult would speak this way. Haha Chris not sharing his toys? How did you determine that? HE RUNS A DEAL SHARING WEBSITE. Which btw is free, and not ad ridden. Seems like he is the perfect example of someone who did share his toys. Anyways here's an example of a $356 fare. I suggest you brush up on your internet skills before being so horribly rude on such a large (and helpful) message board. This is a very low fare for a great airline like Copa. I can only imagine how angry John will be at Chris if this were to be a price error. Just wanted to say thank you for posting this. We booked our flights for the very, very low price of $357 and it appears they had nearly doubled for the same price the next day. So glad to have found your website! I am a huge fan and will pass this along to everyone who is looking for travel deals! Thanks SP! Glad you were able to get in on that temporary price drop.